G&H Building Services’ mechanical and electrical work as part of a major residential redevelopment scheme in London is progressing at pace ahead of completion this summer. The 1960s Carolyn House office block in Croydon is being refurbished, converted and extended over 23-storeys into a mixed-used scheme for HSBC Pension Fund (UK) Ltd.
For the first time, G&H Building Services is using Revit 3D modelling and will include Construction Operations Building Information Exchange (COBie) operations and maintenance information. The development has seen the existing building stripped out and partially demolished internally. A six-storey extension on the existing roof will take the number of residential apartments to 183. 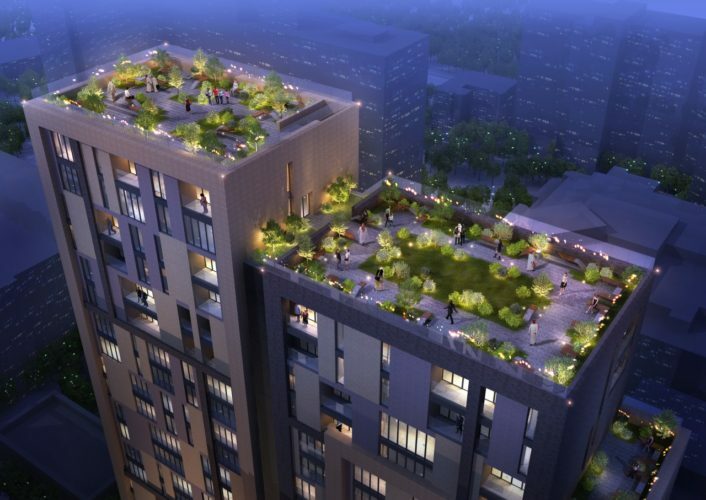 Retail space is being provided at street level while modern and luxurious roof gardens – tiered over two levels – will be created for residents to enjoy. G&H Building Services’ mechanical and electrical work included BIM modelling at the design stage and heating, power distribution, fire alarms, heat recovery ventilation and domestic services. A central plant room-based district heating system will feed individual interface units in each apartment when occupied. Senior Contracts Manager at G&H Building Services, Paul Cuss, said: “Work is progressing well with 90 per cent of the plant rooms completed. “All apartments will have been second fixed by the end of the month with the final fix and commissioning underway ahead of completing the project this summer. “Our M&E is complementing the contemporary designs of the scheme and will provide a high level of comfort for residents. G&H Building Services was appointed by the main contractor, JJ Rhatigan.